Just over two years ago I did my first ever pictorial over on Instagram. I have been thinking for a little while now that I should re do the pictorial and add it to my blog. Scrolling through Instagram to find it is an absolute pain. Today just so happens to be "inspired by a tutorial" for the 31DC2016 challenge I am doing. I figure today is the perfect day to add this tutorial to my blog. 1. Paint your base coat (and top coat) and allow to dry fully. 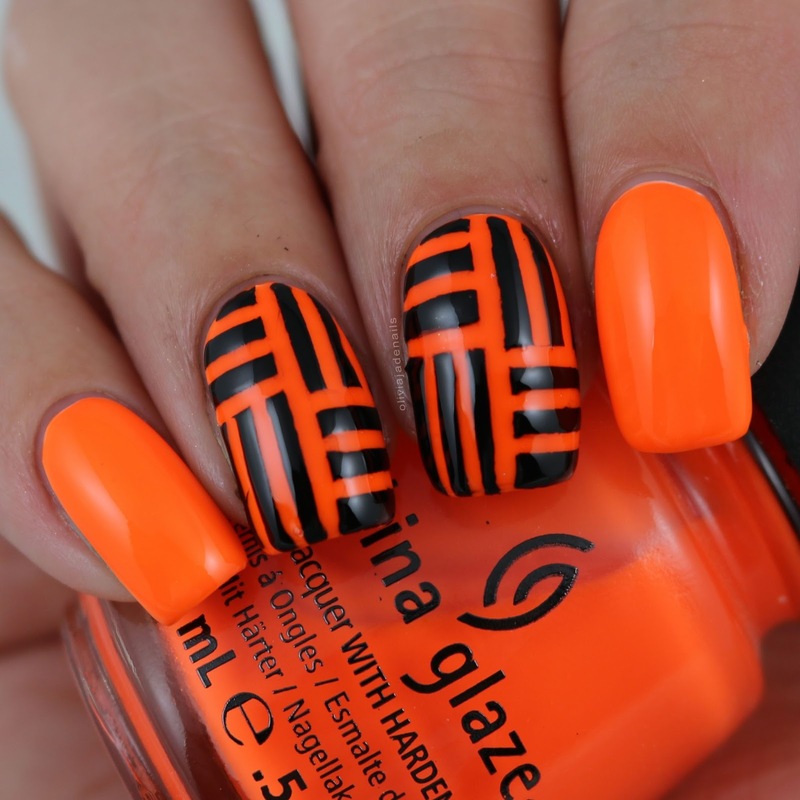 For my base colour I am using China Glaze Knockout Orange (over white) and used Seche Vite as my top coat. 2. 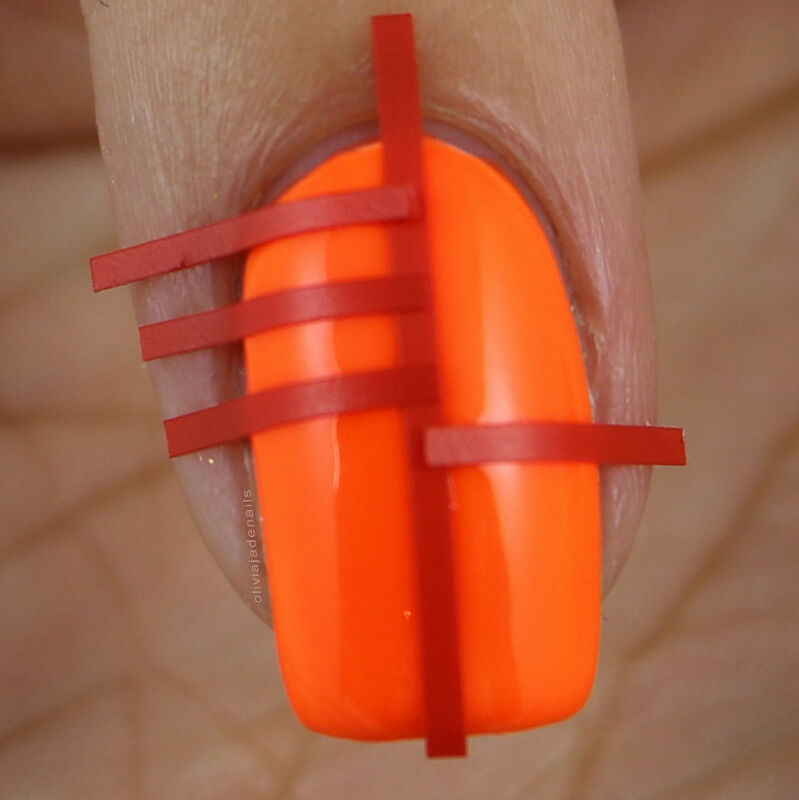 Place a straight nail vinyl or piece of striping tape down the center of your nail. 3. 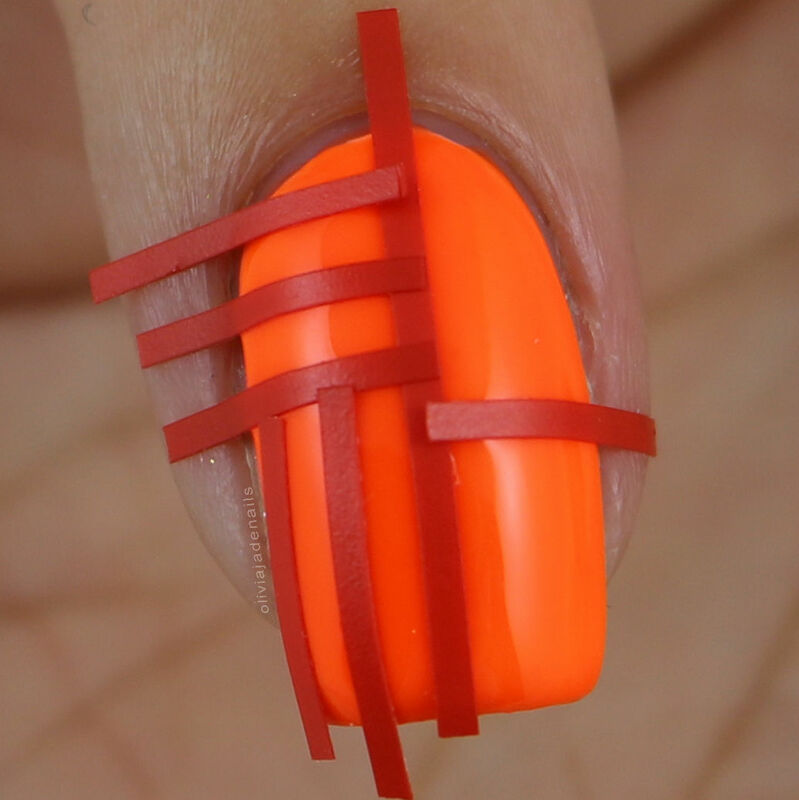 Place two vinyls across the middle of the nail. I don't like to have these lining up but that is just a personal preference. I also cut a nail vinyl in half for this step as the vinyl is too long for what I need. 4. After cutting another vinyl in half place the two pieces evenly apart horizontally in one corner of you nail. Where you start is completely up to you. 5. Again cut another vinyl in half, however this time you will be placing the two pieces evenly apart in a vertical direction. 6 & 7. These steps are the same as steps 4 and 5, however you will just be switching the direction of the vinyls. 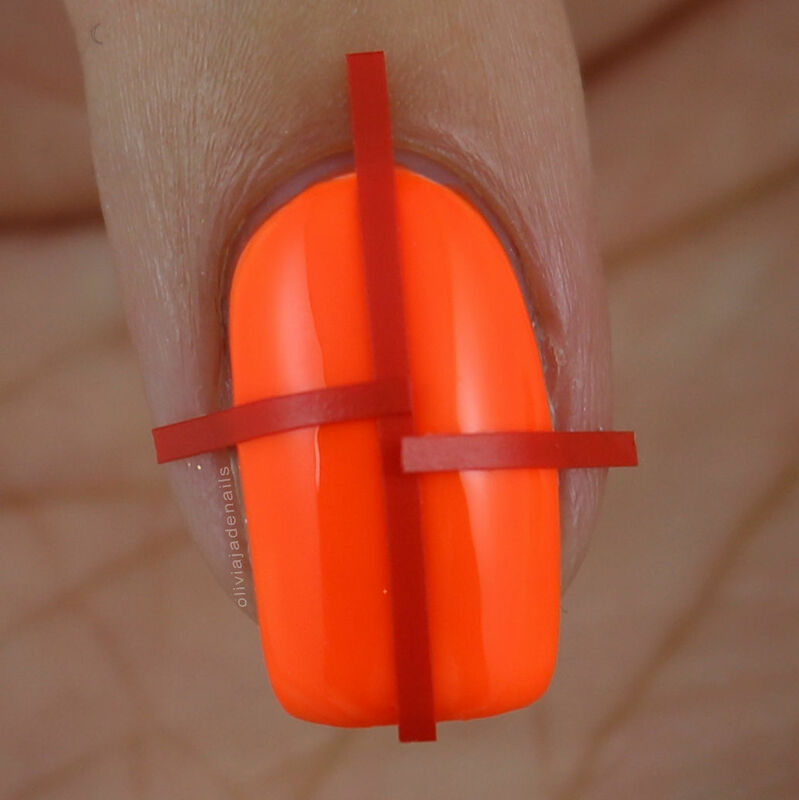 For example, if you have your tape going horizontally near your cuticles you will want your tape to be vertical on the other half of your nail near the cuticles. 8. 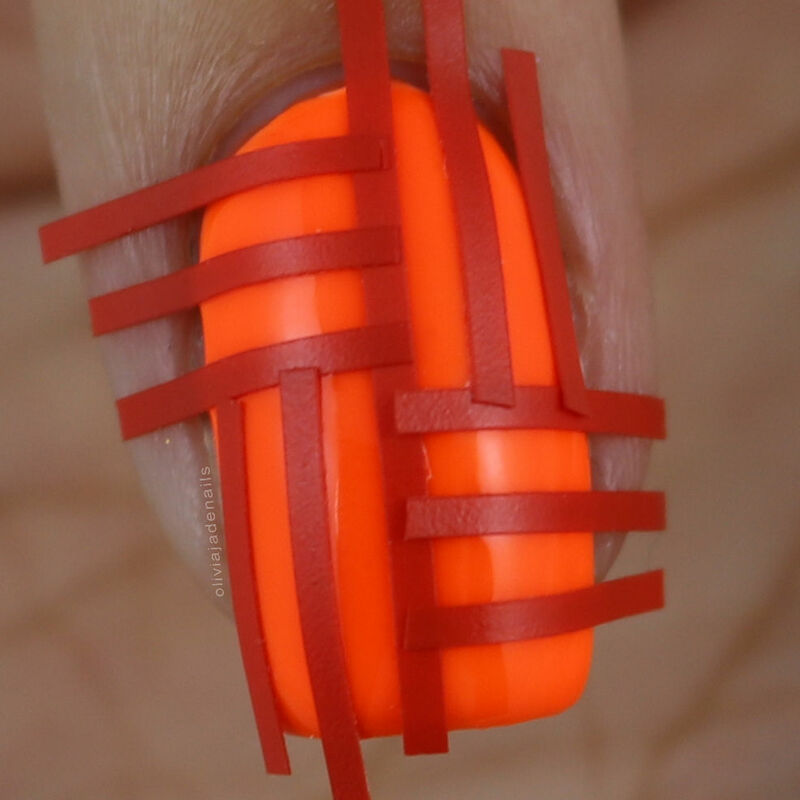 Apply your second colour over the top of the vinyls/striping tape. For this step I used China Glaze Liquid Leather. 9. Remove all vinyls immediately after you have finished step 8. If you let the polish dry you may not get crisp lines. Once your top layer of polish has dried, add top coat. Don't forget to clean up any unwanted polish around your nails! 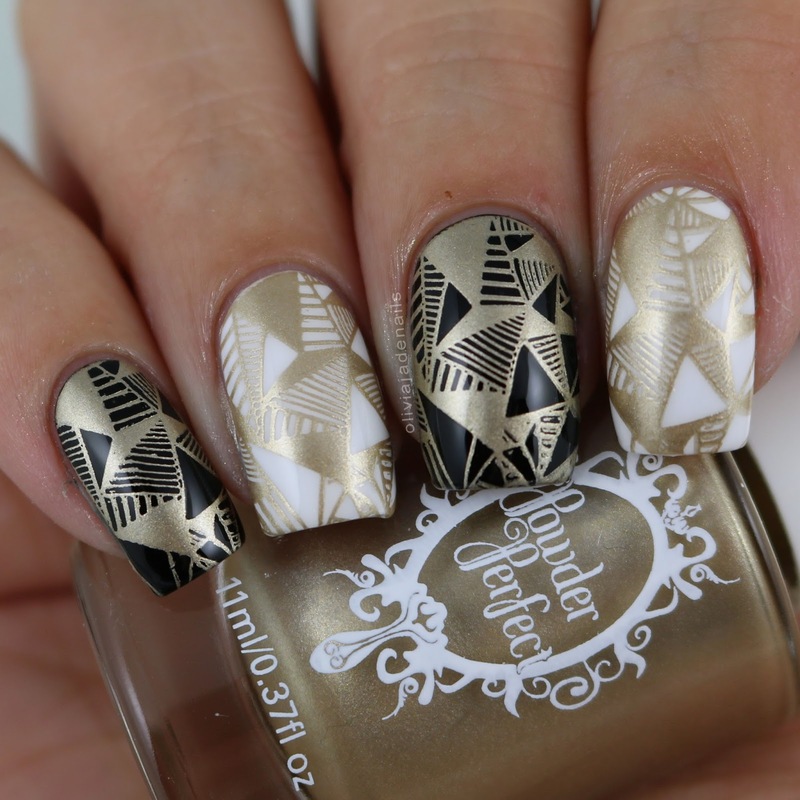 What do you think of this mani? Is it something you will try out? If you do make sure you tag me on Instagram (or even post it in my Facebook group) so I can check it out! Let me know your thoughts on this type of tutorial and if there are any other tutorials you would like to see me do. 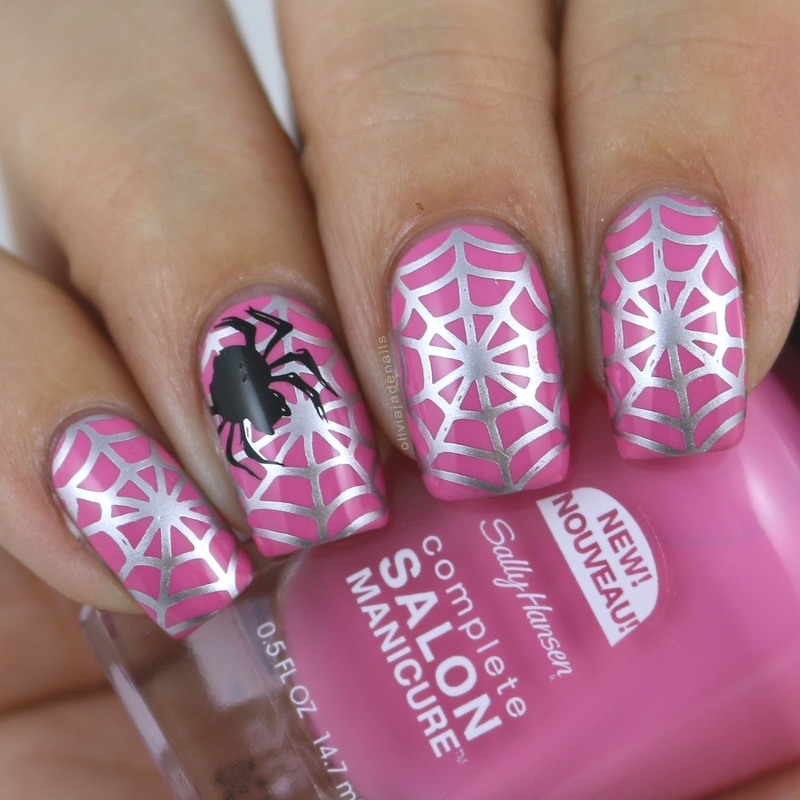 While Halloween isn't such a big deal here in Australia, I am a sucker for all Halloween nail related things. No idea why. 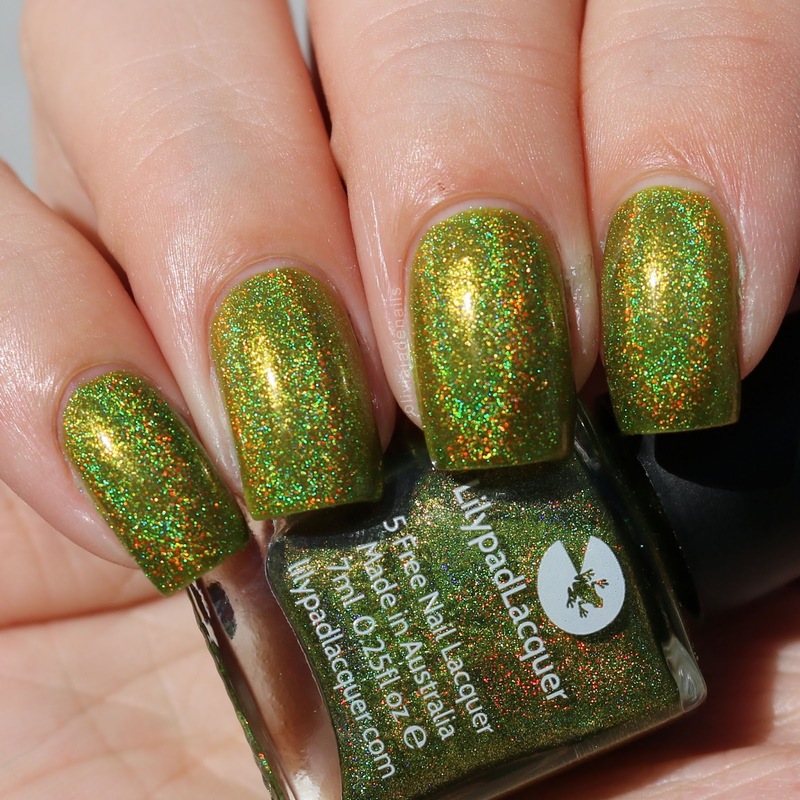 I normally lean towards more girly things like pinks and purples, flowers and butterflies, etc but Halloween time is when some really unusual polishes come out that grab my attention. Powder Perfect's Halloween Duo has certainly done that this year. The duo is inspired by the three witch's poem from William Shakespeare's Macbeth and features complex finishes in unusual shades that perfectly capture the spirit of Halloween. Warning: this post is a little picture heavy. Cauldron Bubble is described as a darkened multichrome lacquer that shifts from purple to green and feature copper-fuchsia-green ultra chameleon chrome flakies. I'm not sure about the base colour shifting from purple to green. To me it looks like a darkened purple base with green shimmer and the ultra chrome flakies. However, you want to describe it this polish is awesome! I particularly like it matte. The formula is good, although it does apply unevenly on the first coat. I used two coats for my swatch. 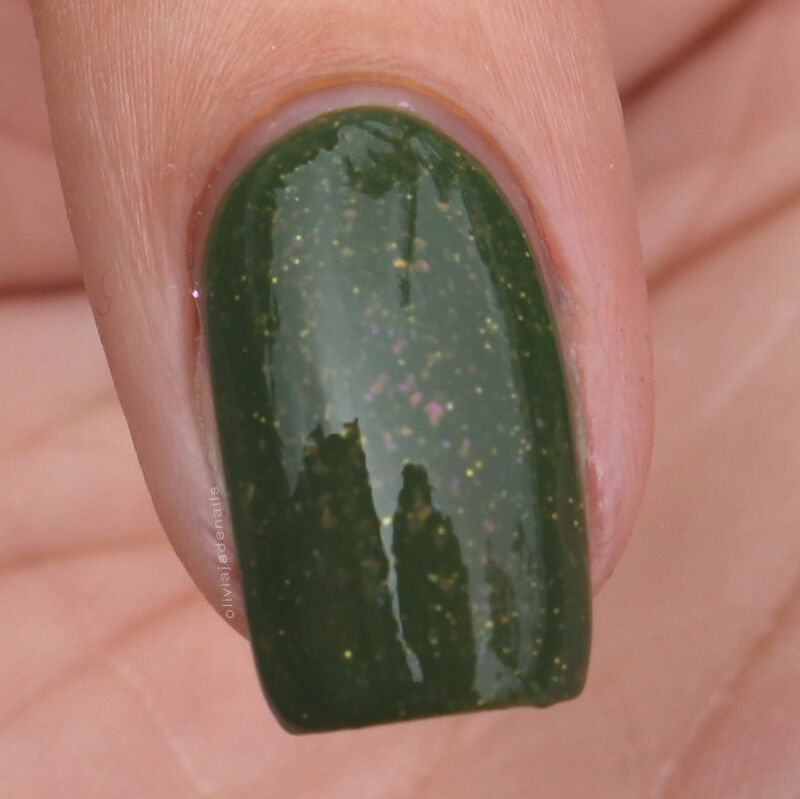 Toil & Trouble is a murky olive green with contrasting pink iridescent flakies and gold holographic glitters. Unfortunately by the time I got to swatch this all forms of "sun" had completely gone. In fact, I had trouble finding a picture that didn't have rain drops on it. Oh the joys of trying to swatch things. Anway, the formula of this one is great. It applies evenly and is opaque in two coats. The pink flakies are a little tricky to see in pictures. They are more obvious (but not in an over the top, in your face kind of way) in person. And the mattified version. Personally I prefer this one mattified. I just can't stop looking at my nails. This is a seriously awesome Halloween duo! 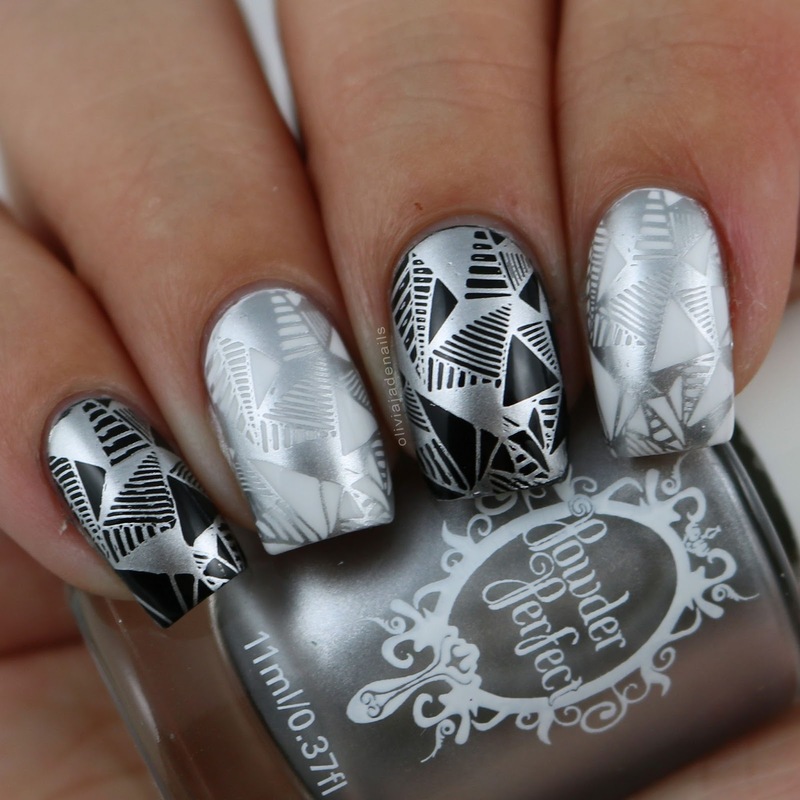 I particularly love the mattified versions of both polishes. 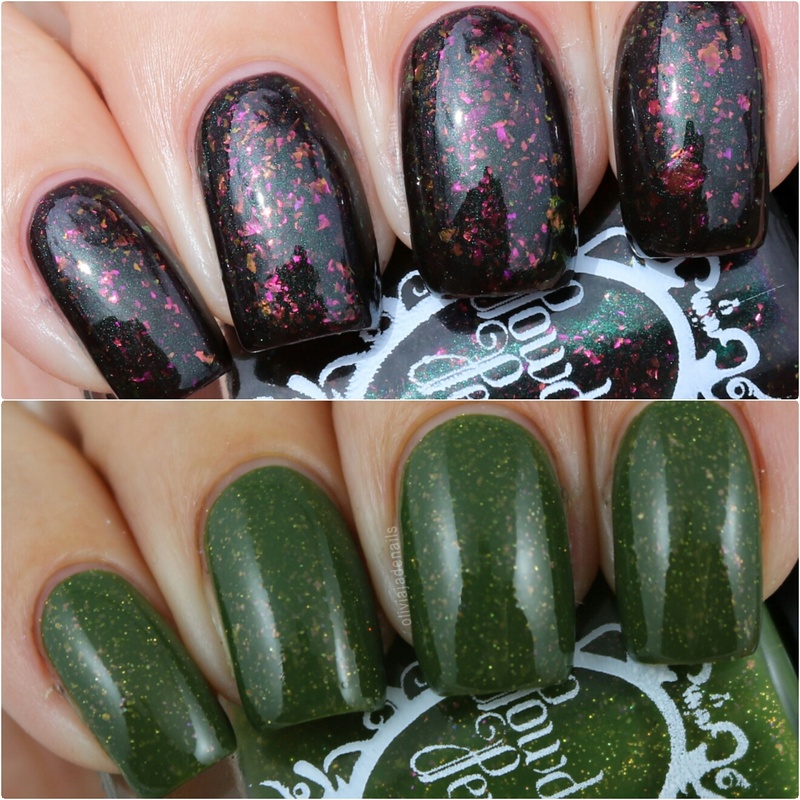 The Halloween Duo is available from Powder Perfect's Australian Store on Friday 30th September at 10am AEST and from their international site on Thursday 29th September 8pm EDT. I am sure I say this way to often but I honestly can't get over how quick this year is flying by. It's so crazy. I had a serious reminder that October is soon approaching when the new Pueen Cosmetics Halloween Party 01 plate arrived at my doorstep. In fact, I have actually had a few Halloween things arrive for me to play with lately. There is definitely some exciting things being released which I will begin sharing with you this week. So let's kick off the Halloween celebrations with Pueen's Halloween Party 01 plate shall we? This is definitely one of the most cutesy Halloween plates that I have seen and I really like it. I can see me using this one a fair bit over the coming month. The images are quite large (which isn't necessarily a bad thing) but they stamp really well. 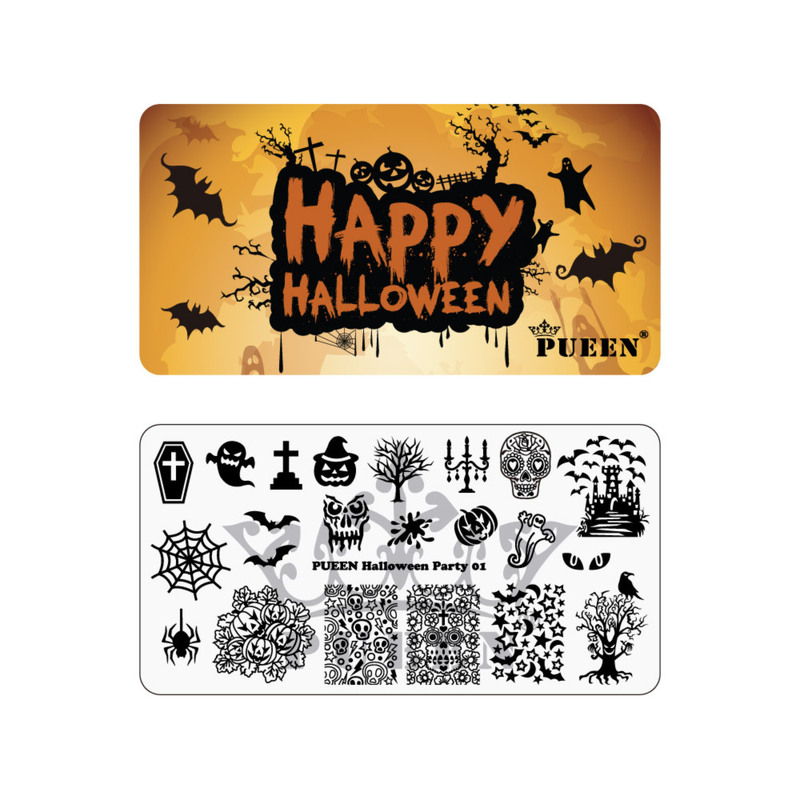 The Halloween Party 01 Stamping Plate is available from Pueen Cosmetics. It appears that while I am begging for some lovely Spring weather, the rest of the world is preparing for Autumn/Fall. Of course that means that there are lots of fall coloured polishes being released and of course fall nail art supplies. 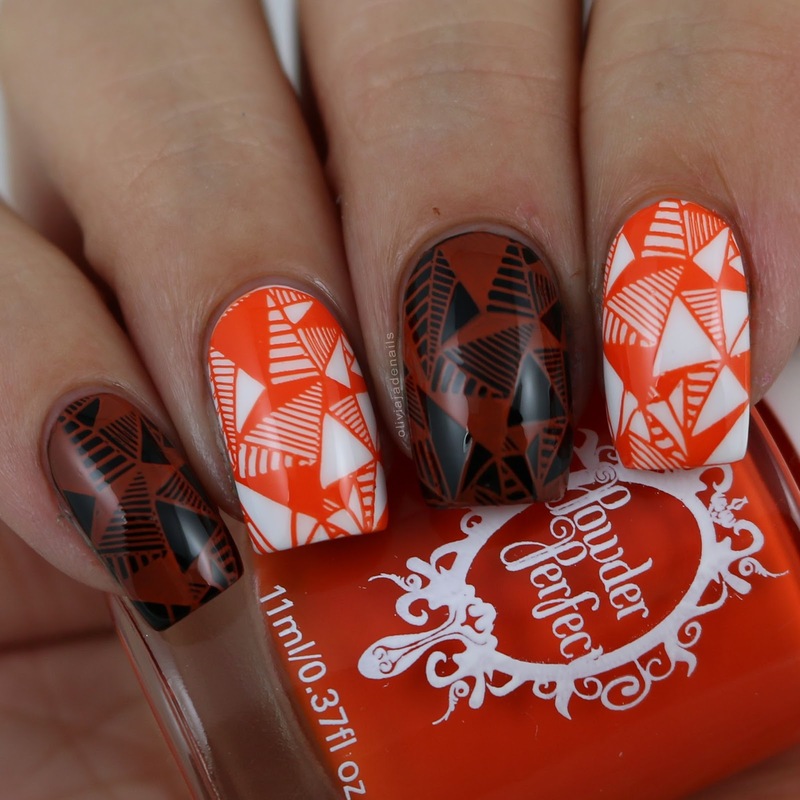 I was lucky enough to receive the new Lovely Leaves Stamping Plate from Uberchic Beauty which I will be sharing with you today. Now because my mind isn't in Fall/Autumn mode so I may have used this plate a little differently than most. There appears to be a change in the blue film/plastic that comes on top of the stamping plates. I noticed it with the last of the plates I reviewed (although I can't remember if I mentioned it or not) that the new blue plastic leaves behind a lot of sticky residue on the plate. It does come off with acetone, but boy is it a pain. That really is the only complaint I have with this plate. The images are great and they stamp really well. 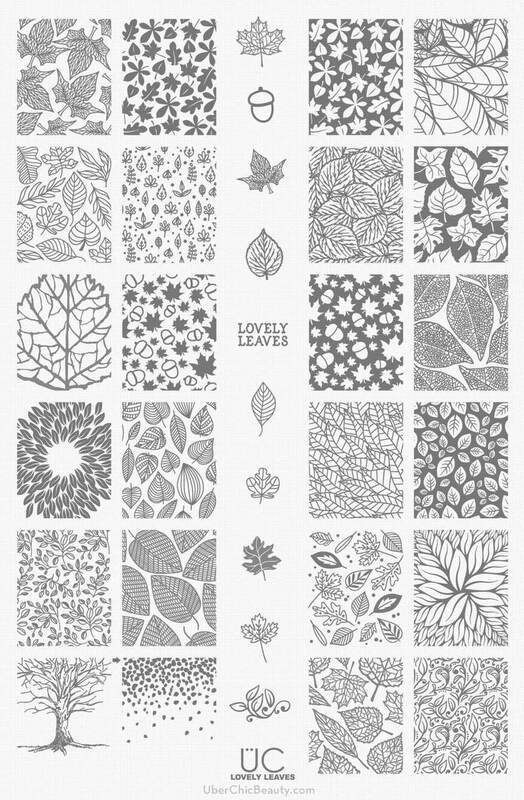 The Lovely Leaves stamping plate is available from Uberchic Beauty. 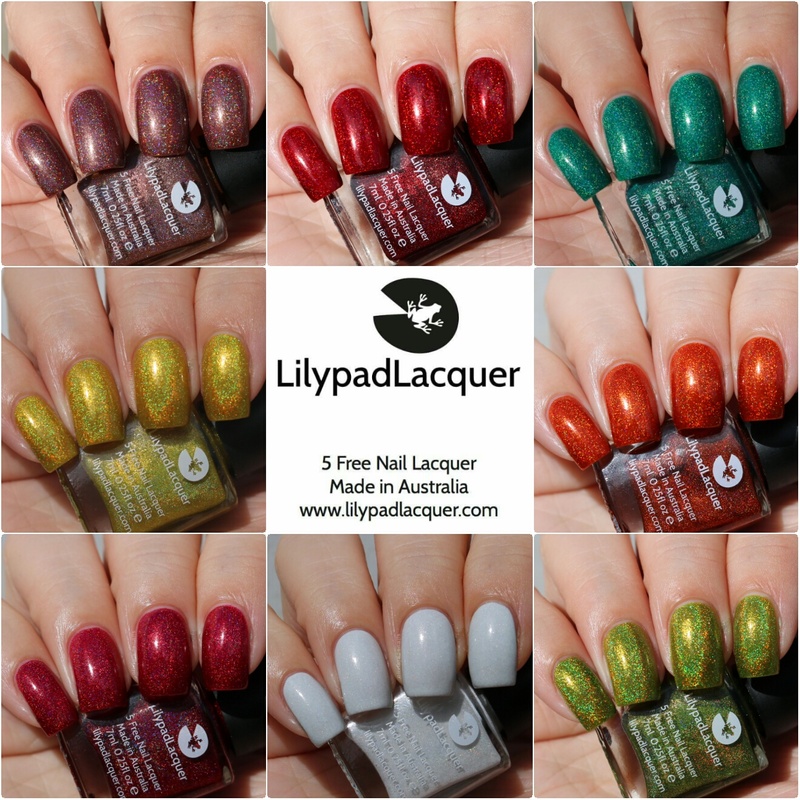 Melbourne decided to turn on a little bit of sun again the other day (including a sun shower which made swatching certainly interesting) so I managed to complete all of my swatches of the new releases from Lilypad Lacquer. Yay! I will have all links to all of the other new releases at the bottom of this post. In case you are curious and have missed out on any so far there are a total of thirty new polishes. So many pretties. 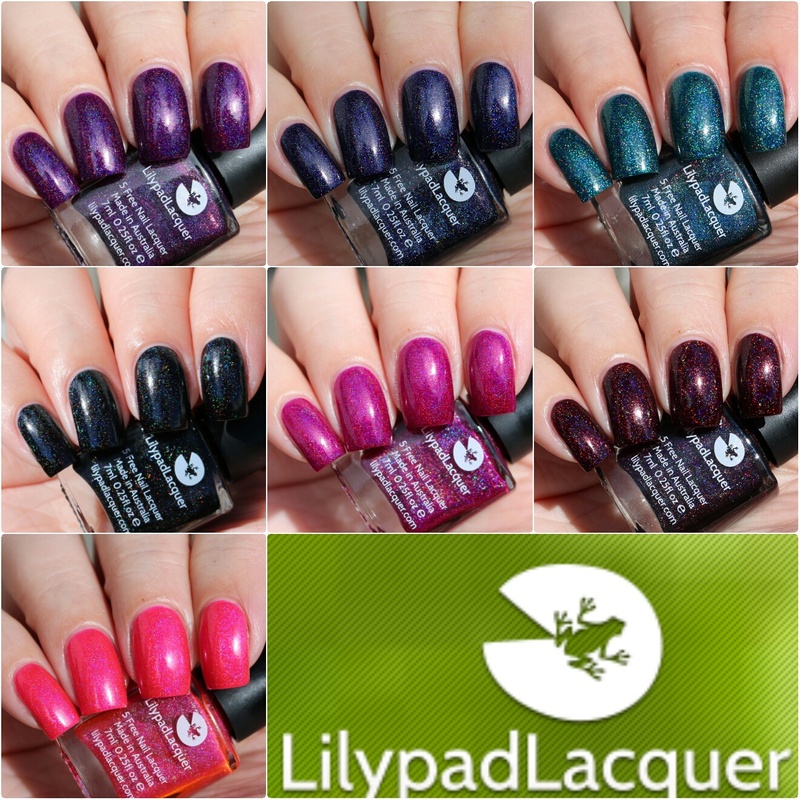 Right now let's take a look at the final seven polishes shall we? There are a couple of things I should note before jumping in. The day that I swatched these the sun was very hit and miss. When it was out it wasn't always that strong so some of these polishes are more holo than they may appear in some of my photos. Also, all pictures are shown without any top coat. Beet This is a vivid magenta holo. Now this polish screams my name. I started drooling as soon as I saw this one. 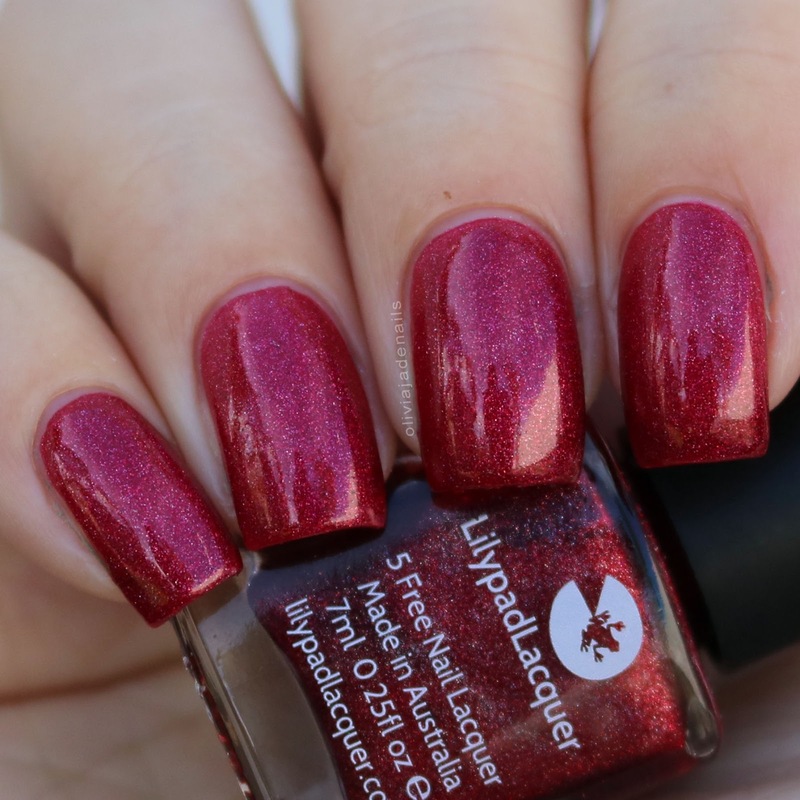 The formula is fantastic, it applies evenly and is opaque in two coats. And the colour is to die for. Seriously! Nightingale is a black holo with a golden hue. This one I found dragged a little when you applied polish over the same spot so minimal brush strokes are needed for this one (mainly on the first coat). My swatch shows two coats. 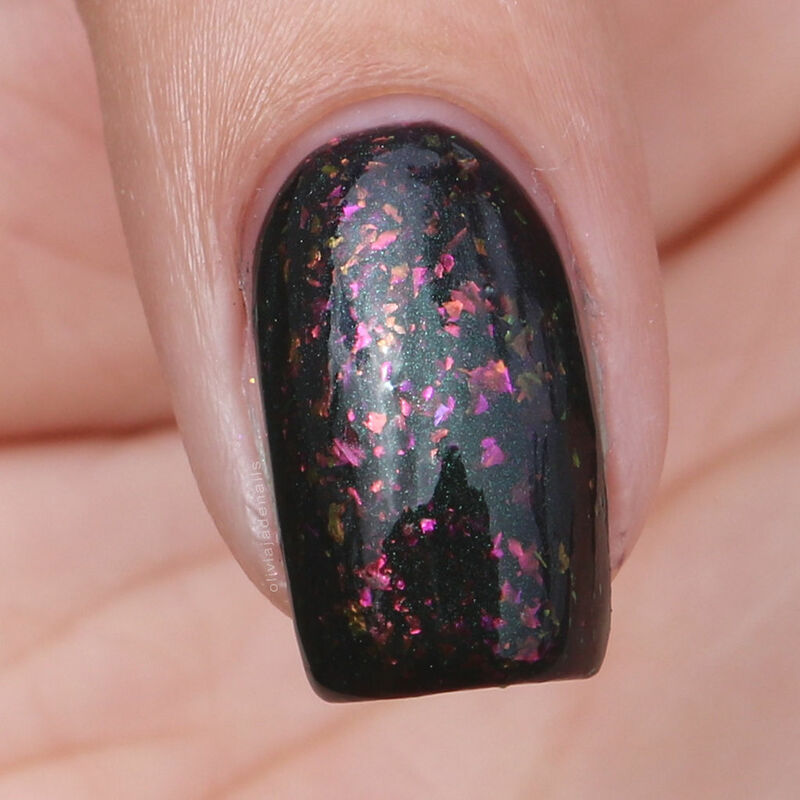 Nightshade is an eggplant holo. The formula is great and easy to use. For my swatch I used two coats. 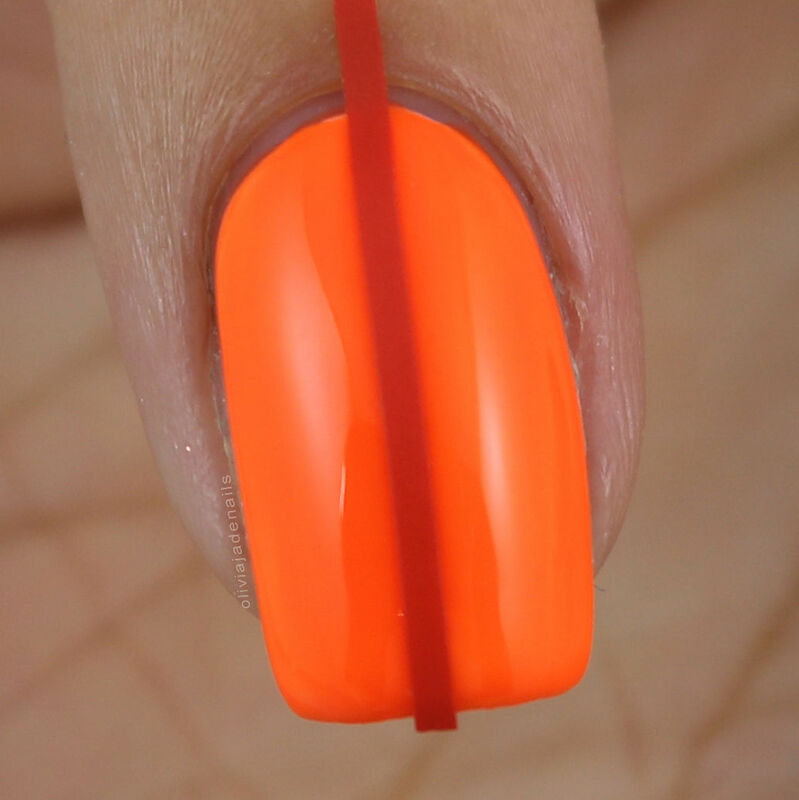 Nu-clear Pink is a neon pink holo. This one is quite a pretty colour, It is a little on the sheer side. I found that I had a slight visible nail line still after three coats. I would wear this one over a white base next time. Phantom is a deep pink toned purple. Nice colour and good formula. My swatch shows three coats. Shockwave is a bright royal blue holo. I think this one would make a fantastic base for some galaxy or night sky nail art. The formula is awesome and so close to being a one coater. My swatch shows two coats. S-tealing The Show is a rich teal holo. Really pretty colour with a great formula. My swatch shows two coats. There are so many gorgeous colours in this lot of the releases. 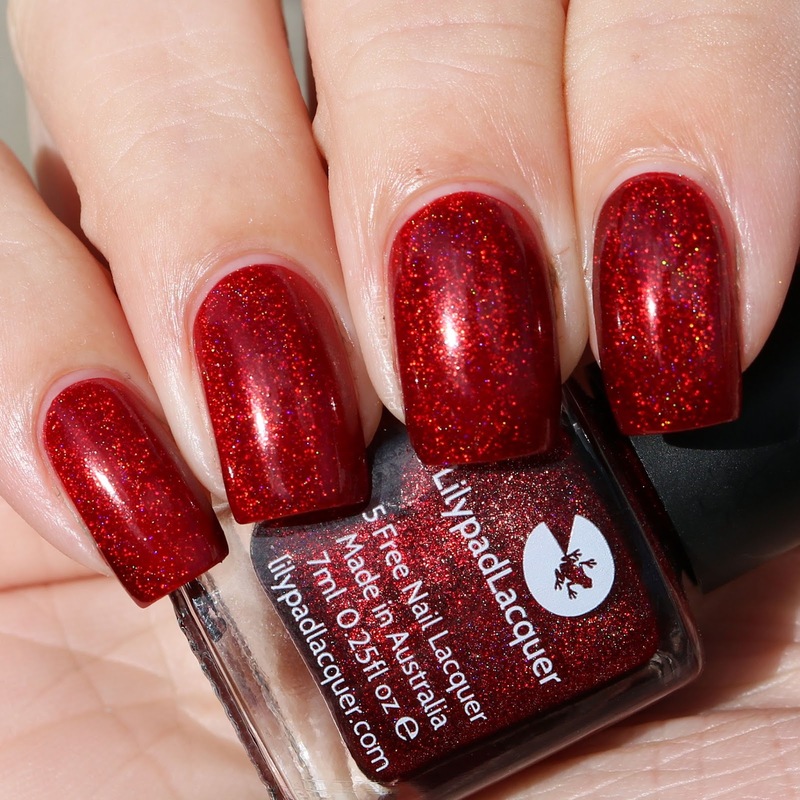 My personal favorite maybe out of all thirty of the polishes would have to be Beet This. I also really like Nu-clear Pink, Phantom, Shockwave and S-tealing The Show. Today I have a completely different post for me. I normally skip over posting Press Releases here simply because most of them are posted a billion times everywhere else. This press release is something that really needs to be posted anywhere and everywhere. 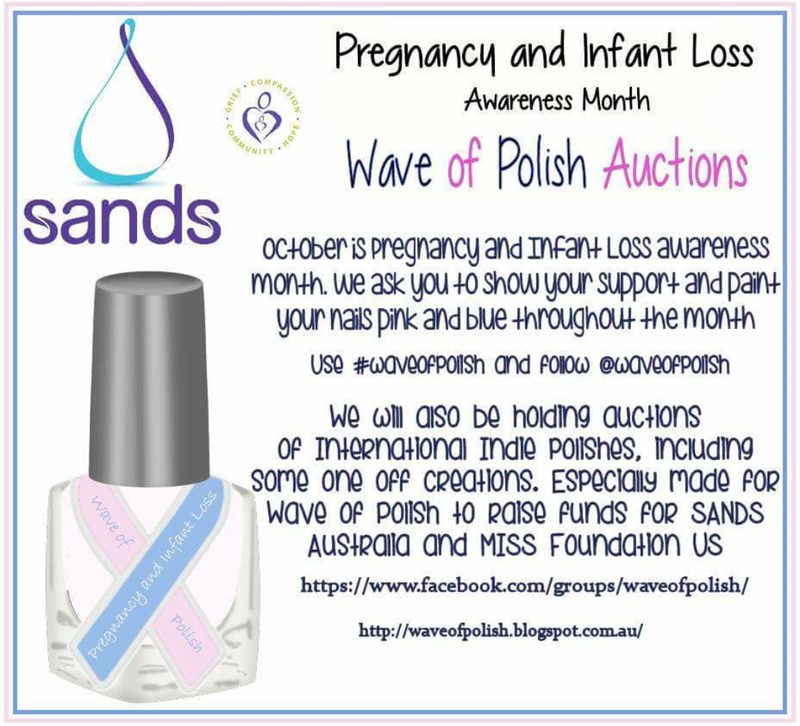 It's for such a great cause and I hope that a lot of you guys will jump on board and share some manis throughout October (particularly on October 15th) and take part in the auctions. In the first event you are encouraged to paint your nails pink and blue to show your support. You will also help raise awareness of pregnancy and infant loss. We are in our 4th year and have found many people encouraged to share their story, some for the first time, just through the simple act of sharing our nails. Please don't forget to post your manis on social media using the hashtag #waveofpolish and follow the IG @waveofpolish. October 15th is Pregnancy and Infant Loss awareness day, this is the best day to show your support. 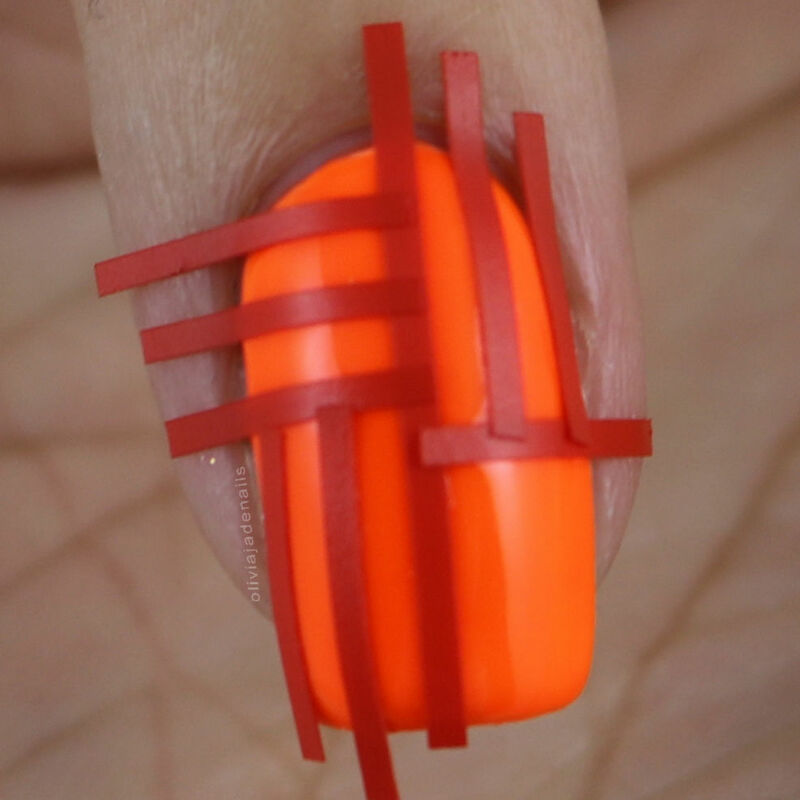 If there is only one day you can paint your nails this month, please chose this date. To honour the little ones taken too young on the 15th of October at 7pm wherever you live please join in and stop a moment with us and light a candle. As the clock, strikes seven in different parts of the world a wave of light will wash over the world for those precious angels who we no longer share this earth with. We also want this to be a day across the nail community that shows parents we care, we remember, we are here to support you by sharing your nails.